We all want our children to be great readers. We know intuitively that reading will play a critical role in their future success. Certainly, having them read a great deal is a crucial component of this process. The more children read for pleasure, the better their reading will be. Here are some ideas I hope will bolster your child’s enthusiasm for reading. Jody, our guest contributor, is a grade five teacher. 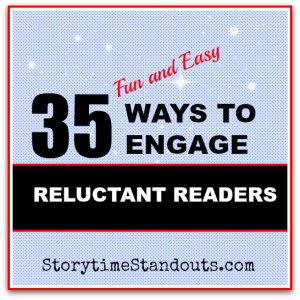 Follow this link to see what she writes about inspiring a reluctant reader and, in addition, you can read Storytime Standouts’ book suggestions for reluctant readers. Reading aloud to your child will increase his interest in books and also his desire to read. 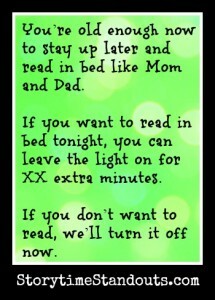 Don’t stop reading aloud just because your child has learned to read independently. 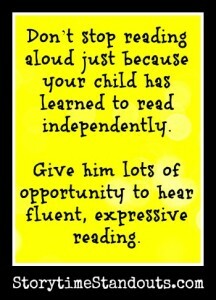 Give him lots of opportunity to hear fluent, expressive reading. Remember, just as you did before your child could read, choose books that are just beyond his independent reading ability (at least some of the time). Try to read non fiction as well as fiction. Finding a non fiction title to match your child’s interest(s), will encourage your child to use books for information as well as entertainment. Get a public library card and wear it out. Explore the nonfiction call numbers. Try borrowing a book from the 100’s (i.e. astrology), 200’s (i.e. myths), 300’s (i.e. aircraft)… or try one author from each letter of the alphabet. 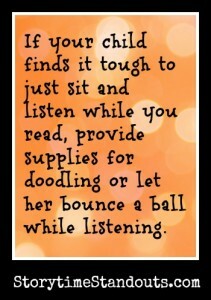 If your child finds it tough to just sit and listen while you read, provide supplies for doodling or let her bounce a ball while listening. 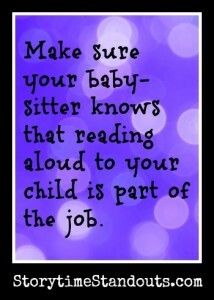 Make sure your baby-sitter knows that reading aloud to your child is part of the job. 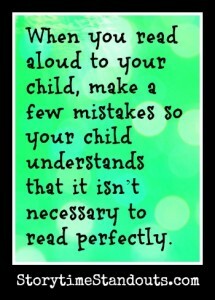 When you read aloud to your child, make a few mistakes so your child understands that it isn’t necessary to read perfectly. Have a dictionary available in case you encounter an unfamiliar word. When reading aloud, pause to discuss the story, make predictions about the outcome, and look at the illustrations. Just as you might with a movie or a television show, take time to discuss your reactions to a book. Occasionally read only the beginning of a book (aloud). Once it appears your child is interested in the story, suggest he finish it (on his own). Ask your child to help read the recipe and the directions when you cook or bake. Assemble models or learn magic tricks or games following the directions your child reads aloud. Make up a treasure hunt for a small surprise. Use a series of written clues. Have a scavenger hunt – your children can read the list to determine what they are to find. Write notes to your child; ask your child to write notes to you or someone else. Perhaps if one parent leaves for work early or travels on business, he or she could leave messages for the child to read. Arrange for your child to receive letters or email messages from an adult. Make a scrapbook about the child or put together a photo album, add captions for your child to read. Pick a team or an athlete to follow throughout a season, get a schedule of games or events and then watch for stories in the newspaper. Read the stories together and record the scores or make up a scrapbook and include interesting articles. Read side by side with your children. Make sure your child knows that reading is a pleasurable leisure activity for you. In one family I know, Dad reads the bedtime stories aloud while mom has a chance to read her own book nearby. Cut out interesting newspaper stories and pin to the refrigerator or put them at your child’s place at the table, “I just thought you’d be interested in this article.” Talk about a comic or a sports column. Subscribe to a children’s magazine. Check out the web. Several authors have good web sites your children will enjoy. The directory section of this web site includes some good links. Check out Lemony Snicket (if you dare) and John Scieszka. Keep books handy in the car so they are available when you’re waiting for a doctor appointment or stuck in a ferry lineup. If all else fails, try books about dinosaurs (567.91), sports (796 – 799), humor (817, 827). Movie review books are much like dictionaries. Have your child check out the reviewer’s rating of a movie (and practice dictionary skills at the same time). Give your child an opportunity to read menus either when at a restaurant or when ordering pizza. 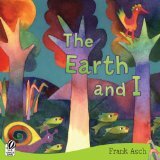 Next time your child asks you about stars, animals, or space go together to resource material either at home, on line or at the library. Try using book and cd combinations. Perhaps a family member could record stories for your child to listen to. Next time you are in a mall, encourage your child to take a look at the floor plan, find out where you are on the map and then find your destination. Almanacs and Guinness record books often have a special appeal for intermediate grade students. Collectors’ catalogues will have a wealth of information for a child who collects. After viewing a television show, movie or video, try reading the original story and comparing it to the dramatization. (Shrek by William Stieg is not at all like the movie it inspired). Try puzzle books – stories are often complete in a few pages or paragraphs and require careful reading. Your child may take great pleasure in solving the puzzle and challenging you to do the same. Hover over the bookcover for a description of the post. Click on the photo to read the full story.